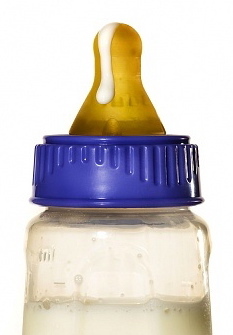 Moms typically choose between prepared infant formulas and breast milk for feeding the baby. In rare cases, moms may not feel comfortable with either of these choices. Alternative feeding choices for the baby are limited, but there are some choices mom may want to research. Not All Milk is Safe: Mom should never substitute breast milk or infant formula with straight cow’s milk or goat’s milk. These milks have all the calories the baby will need, but not all of the nutritional content needed to sustain healthy growth. Cow’s milk contains proteins that are not digestible until after the babt turns one year old. Cow’s milk also contains minerals in levels that may be damaging to a newborn kidney system. Homemade Formula: A quick search of the Internet reveals hundreds of infant formula recipes moms can make at home.Moms who wanted to ensure their baby’s health chose to research nutritional values and create homemade recipes for infant formula. Some of the recipes will include ingredients that are not readily available. While homemade infant formula is not suggested by pediatricians or obstetricians, mom has the final say. Before switching the baby to a homemade formula, it is important to speak with a certified homeopathic expert with experience in infants and children. For a variety of reasons, mom may choose to breastfeed and bottle-feed. While newborns are not typically happy with the switch between breast and bottle, some moms may be able to add a bottle once in a while with success. By adding bottle feeding into the mix, dad will have the opportunity to feed and grow closer to baby.